We've come a long way since two paddles and a ball were laughably called Tennis in order to skirt some copyright issues (no it's not Pong, it's Tennis!). Now not only do we have real players and an actual net, but a pseudo three-dimensional court as well! Now all we need are those cute little grunting noises the players on TV make and we'd be all set. 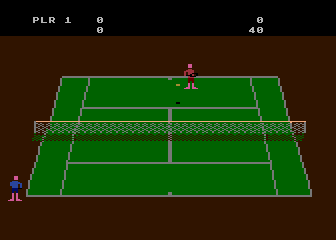 Although the graphics are a bit more detailed, the 5200 version of RealSports Tennis doesn't look all that much different than its 2600 counterpart. 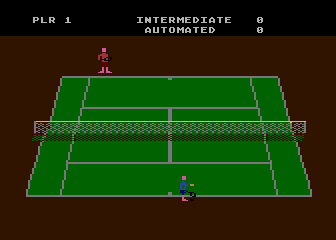 Then again tennis is a rather simple sport, so there isn't much the programmer can do. The 5200 does do a nice job of following all the rules of tennis (notice how all the lines are actually on the court this time? ), and the computer AI puts up a pretty good fight. 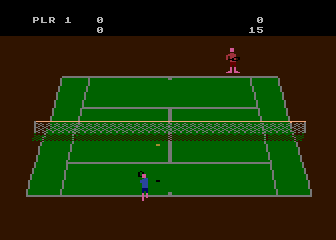 One nice thing about the 5200 version of RealSports Tennis is that it's Trak-Ball compatible. Normally the Trak-Ball doesn't work well for sports games (like RS Soccer), but for some reason it works wonders in RealSports Tennis. By using the Trak-Ball you can watch your player glide majestically across the court while putting the smack down on the computer. The standard 5200 sticks also work well with this game thanks to their non-centering analog nature. RealSports Tennis is one of the few 5200 games (one of only three actually) to allow for four players (time to break out that old four port system). Simply select the 'Doubles' option from the title screen, press '4' to enter "Sean Special Mode", plug in four controllers (or preferably four Trak-Balls) and away you go. 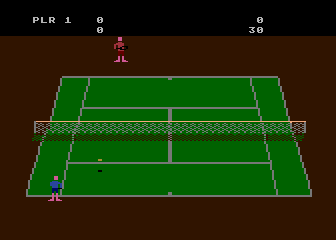 Having four players playing tennis all at the same time is quite a sight, and is great way to kill an afternoon with four friends (assuming you have that many). Although it really didn't break any new ground, RealSports Tennis is a solid tennis game and helped bolster the 5200's sports lineup. Unfortunately the 5200 was loosing the sports battle to the Intellivision, so no new sports games were ever developed after the RealSports series (the 2600 did see a few more in the late 80's). Still if you want a solid game of tennis, RealSports Tennis will satisfy your needs. You can even make the grunting noises if you want to.